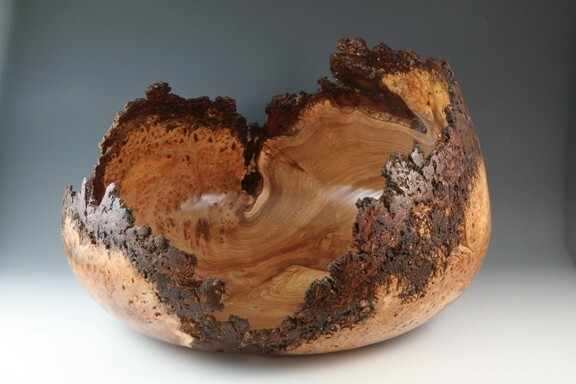 “Wood Transformations,” the latest exhibit to grace Paso Robles’ Studios on the Park, features the work of woodworkers Roger Combs and Barry Lundgren. THEY’VE GOT WOOD : Good friends and fellow woodworkers Barry Lundgren and Roger Combs present “Wood Transformations” at Paso Robles’ Studios on the Park. While Combs specializes in construction and furniture design, Lundgren, whose work is pictured, employs a more free-form approach. The two approach the medium from different angles. Where Combs renders highly functional works of art—bed frames, tables, chairs, and chests of drawers—Lundgren often works with wood’s organic forms and imperfections to create natural-edge bowls and gorgeous urns. Combs’ elegant pieces are informed by Asian style and Danish design. Lundgren, a woodturner of 20 years, often uses interesting bits of wood he and his friends happen to find—among them walnut, olive, black acacia, and oak. “Wood Transformations” opens Thursday, Nov. 3, with a reception the following Saturday, Nov. 5, during First Saturday: Wine and the Arts (downtown Paso’s art, wine, and music-filled tradition, going down from 6 to 9 p.m. on the first Saturday of the month). Wines from Castoro Cellars and a live performance by local act the Vanishing Mountain Boys will round out the evening. Studios on the Park is at 1130 Pine St. in downtown Paso Robles. Visit studiosonthepark.org or call 238-9800 for more information.